I’ve always felt passionate about giving back to the community we live in. 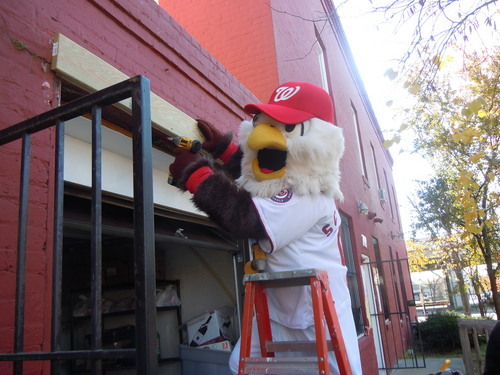 Today, Nationals staff members and I put that belief into action again by refurbishing the Little Light Urban Ministries an organization that provides after-school car, academic assistance, mentoring and a number of community programs in Southeast D.C. Some of the projects we tackled were reinforcing building support beams, capping an unused chimney, painting several rooms, and repairing a water pipe leak. I myself, had NO IDEA how to fix any of these problems, but luckily experts on the Nationals staff were able to help me. I’ve attached a few pictures of the work that we did yesterday and this morning. Luckily for me, I only got a little bit of paint on my feathers, and thankfully, my brand new jersey survived paint-free! Giving back to the community always feels great and I hope everyone will join in my efforts to making this area we call home a better place to live in for everybody! Tomorrow check me out at the Montgomery County Thanksgiving Parade with the NatMobile and check out George, Tom, Abe, and Teddy as they’ll be at the “Walk for The Homeless” at the National Mall from 8-10am! See you all around town!